My brother is engaged--finally! We really thought it would never happen at this point but he has found his someone special and I finally got to use this frog couple stamp I have been holding on to for about 6 years. It is much older than that. I purchased it from a garage sale and have no idea who made the stamp. You may be asking yourself why frogs? My family has been teasing my brother about frogs for years. I make him a special frog birthday card every year and we always find him something froggy for Christmas. When our parents were alive they had a blast with all the frogs so I have continued it. 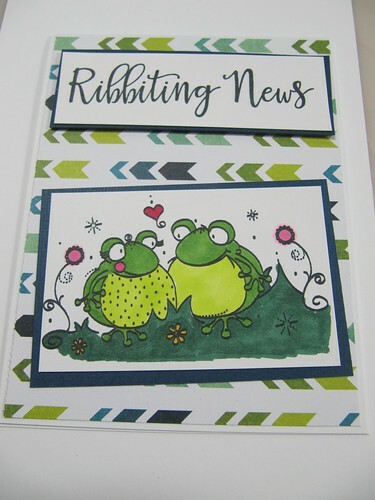 The ribbiting news sentiment is from Paper Smooches Critter Puns set. I'm sure my brother will love it! We will see how his fiancee feels about frogs when I see them later this week.